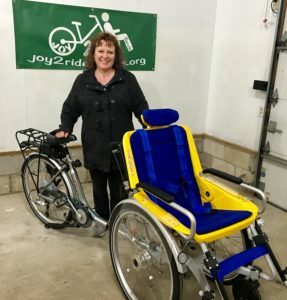 As the Founder of Joy 2 Ride, I personally am no stranger to disability, having lived with birth defects and ongoing structural issues most all of my life that slowly disabled me. I later learned firsthand the AMAZING and AWEsome difference a “simple ride” on the Betsie Valley Trail can make. It was truly liberating and life changing for me! The freedom that comes with cycling is truly AWEsome. So, I want to bring that JOY of being outdoors biking in our gorgeous area to young and old regardless of physical ability. The camaraderie between the passenger and the volunteer who “pilots” the bike will be beneficial in countless ways, not the mention the beauty of our area and the fresh air! Joy 2 Ride is proud to be the first program of it’s kind in Michigan with only a few others in the entire nation! It is definitely a growing trend however! We here in the Benzie area have an absolutely wonderful trail system, a community full of amazing people who value our fantastic area and the “great” outdoors, and have a passion for helping others enjoy life to the fullest, regardless of ability. The goal is to continue to shaping this new program started in 2018, and expand on it as we go, so that individuals living here or visiting the area can have the opportunity to get out on our AWESOME Betsie Valley Trail. There were many steps to getting this program built and there will always be “need” for many things from volunteers, to fundraising, marketing, to T‐shirts, signs, helmets, flags/bags, not to mention insurance, storage, etc. SO if you would like to get involved in ANY way, PLEASE contact us!